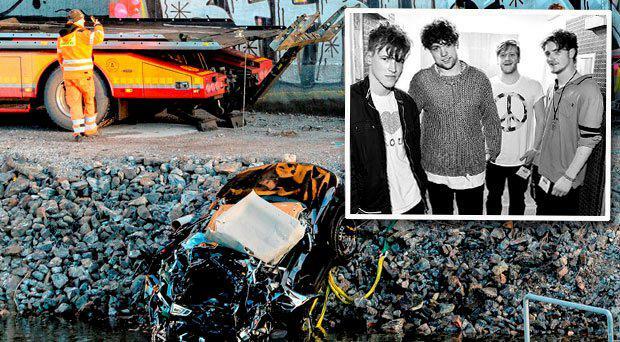 It may never be known what happened when four band members of Viola Beach were killed when their manager drove a car through two crash barriers over a raised bridge before plunging into a canal below, an inquest has heard. Craig Tarry, 32, was behind the wheel of the hired Nissan Qashqai in Sweden last February 13, taking the band back to their hotel after playing at a festival for upcoming bands. As Mr Tarry and the four-piece Warrington-based band of Kris Leonard, 19, River Reeves, 19, Tomas Lowe, 27, and Jack Dakin, 19, drove back along a motorway in the early hours of the morning not far from Stockholm, they approached a bridge over a ship canal, Cheshire Coroner's Court in Warrington heard. Despite a series of flashing warning lights Mr Tarry drove the car down a verge past stationary traffic and crashed through two sets of barriers before hitting a raised section of the bridge and plunging 30 metres into the water below. Mr Tarry had no drugs or alcohol in his system and none of the others had drugs and only small amounts of alcohol in their blood. The cause of death was head injuries except for Mr Lowe who died from drowning. Coroner Nicholas Rheinberg, recorded all five died as a result of a road traffic accident, at the end of a day-long inquest, which was attended by more than 20 family members of the deceased men. He added: "It's not for me to speculate, it is now known, I don't think it ever will be known what happened." Addressing the families he added: "The events we have been hearing about reveal the most awful tragedy for all of you. I'm very sorry you have suffered this terrible loss." Earlier, the court heard the group were following their dreams on tour abroad and were a band "in the ascendancy" at the time. They were making the 125-mile journey from the Where's The Music? festival in Norrkoping back to the airport hotel where they were staying. Graham Bennett, the band's agent, said the group had been on stage to perform at 9.45pm on the night of Friday, February 12. "It went down very well, very high level of promoters in the room, who were all enthusiastic," Mr Bennett said. He left at midnight, as the band set off with Mr Tarry. As the car drove down the E4 motorway at Sodertalje, outside Stockholm, flashing yellow lights and signals warned a bridge ahead over a ship canal was about to be raised, with the middle section of the road lifted horizontally, the inquest heard. Mr Tarry drove down a narrow verge past stationary queuing traffic, clipping the wing mirror of a taxi, and through the first set of barriers around 120 metres from the bridge, the court heard. He then drove in a "controlled manner" at between 43 and 55mph down the centre of the road, with the white lines going under the vehicle. The court heard the vehicle then went through a second set of barriers, 30 metres from the drop into the canal and crashed into the underside of the raised section of the bridge before plummeting down. The impact caused "substantial deformation" of the vehicle, with scraping and damage to the underside of the bridge section, before going over the edge. The vehicle turned in flight, the back of the car hitting the water at 54mph before sinking eight metres to the bottom of the canal. Mr Tarry and Mr Leonard, in the front seats, were wearing seat belts but the other three passengers were thrown from the car. The tanker that had requested the bridge to be lifted then passed over the crash spot along the canal. Technical examination showed there was nothing wrong with the car, the signalling or barrier system, or the procedure for raising the bridge, and the road was wet but not frozen with ice. The alarm was raised when police were informed of car parts and damaged barriers on the road - and they then realised a car had gone into the canal. 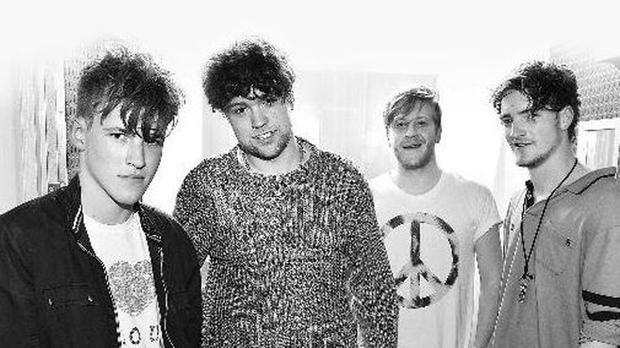 Viola Beach, who had featured on BBC Introducing which showcases up and coming music artists, described themselves as an "indie pop" band. Their debut album was released after their deaths and their debut song Swings & Waterslides entered the official singles chart and topped the iTunes chart as tributes poured in from the music world. Benedict Dunne, father of guitarist Mr Reeves, told the inquest his son studied drama and then changed to music. He said: "It was a situation where, ultimately, River, being the wilful person he was, wanted to follow his dreams. He was doing something he loved, which is not always something you get to do. He was as happy as he's ever been." Following the hearing, Supt Martin Cleworth, of Cheshire Police, speaking on behalf of the families said: "The families of River, Tom, Jack, Kris and Craig wish to thank everybody for their kind support at this heartbreaking time and the support they have shown over the last 10 months. "The people of Warrington and the wider community have been truly amazing, especially in taking Viola Beach to Number One (in the charts). "We would also like to thank Cheshire Police for their commitment to this case and to the five boys who tragically lost their lives doing what they were enjoying. "If possible, we ask everyone to respect the families' privacy at this difficult time." Mr Cleworth went on to tell reporters: "Many questions will remain unanswered and may well do so infinitum. It is a truly, truly tragic case. "Cheshire Police, as in any other UK police force, have no jurisdiction to investigate collisions abroad. What we have sought to do in consultation with both the coroner and our police colleagues in Sweden is to seek to try and present the findings in a way that provides the best possible answers and the best support to the families. "But a number of questions remain unanswered. I am sure there will be speculation, inevitably so. "We don't know the final answer with any definitive logic in terms of what actually happened in those moments just prior to the final collision and tragic descent into the waters. "We have given a commitment to continue to work with the coroner and the families to try and seek to understand some other issues that came from the inquest. "Those questions are unlikely to actually ever get to that fundamental fact as to what went on in the seconds leading to the tragic collision."